Employing their architectural and design techniques, the company use urban space to create fuzzy lines between the built and natural environment. And, a new one on us, we also heard the word ‘biophilia’ for the first time (ok – so we had to look it up!) which suggests that ‘humans possess an innate tendency to seek connections with nature and other forms of life’; in this case plants. We all know trees and plants are great for the environment – they produce oxygen and remove carbon dioxide and contaminants from the air – and even the introduction of a spider plant into the office can raise a smile. 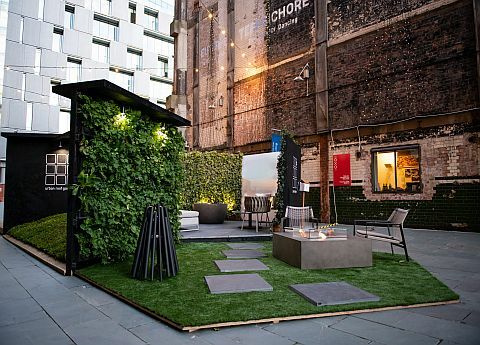 But Urban Roof Gardens take this idea to a whole other level – literally. Their simple philosophy is that by ‘greening the urban jungle’ they are helping to create a better world for both the urban dweller and their urban environment (that’ll be most of us then!). They are passionate about it and have created the world’s leading green wall system. And it really is beautiful to see. We’re normally quite an energetic lot (well some of us) but you instantly feel quite chilled surrounded by greenery. 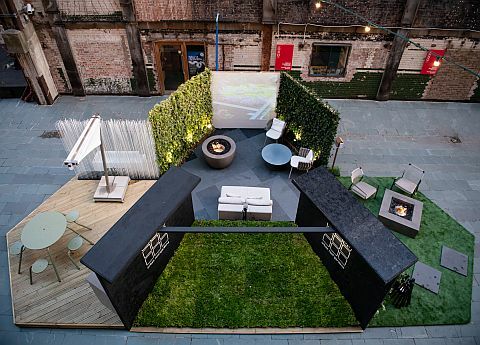 Urban Roof Garden’s innovative LiveProduct range includes the LiveWall, LiveRoof and LivePicture. We were really taken with the LivePicture. This one had been installed above the outdoor kitchen area and, well, was good enough to eat, filled with a mixture of plants and herbs. What a great idea, mixing eating with art! The Live range is modular so if you find that one night you eat your way through all of the basil, it’s easy enough to slot in a replacement module. The other thing we really liked is that you don’t need to worry about watering. 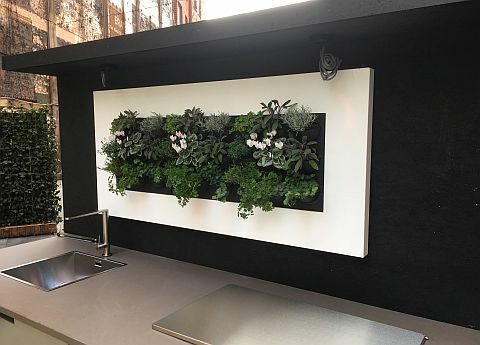 Having had our own ‘green wall’ in the Kings Road show room a couple of years ago that sadly didn’t survive too well (we either killed it with kindness or forgot to water it enough – we’ll never know!) Urban Garden’s clever automatic watering system takes the stress out of remembering to get the watering can out. It’s a very urban spot tucked behind the OXO Tower, which is basically a space between a modern building with small, independent shops and workshops overlooking the Thames, and an old warehouse. The introduction of ‘green walls’ or a ‘living wall of plants’ transformed the area. The walls create a stunning backdrop that can either mask a view, frame it, or simply create a great backdrop. The walls have pre-planted cassettes which, as the URG team showed us, take seconds to change – so you can even reflect the seasons if you’re a green fashionista. They’ll also cool buildings in the summer heat and keep in the warmth during the winter. The weather was definitely a bit mixed over the weekend (vertical rain through to 25 degrees sunshine anyone?!) but our furniture did us proud and withstood the elements, as we knew it would. The Manutti Zendo sofa proved very popular – you can see the side of it in the image above. It normally lives on our first floor terrace where we have the corner version. The beauty of the design is that being modular you can configure it as you want. URG used just a centre piece here and it fitted perfectly. The quick-dry cushions Manutti use, along with robust outdoor fabrics, earned themselves gold stars over the weekend. We think the Zendo probably dried out quicker than the team did! 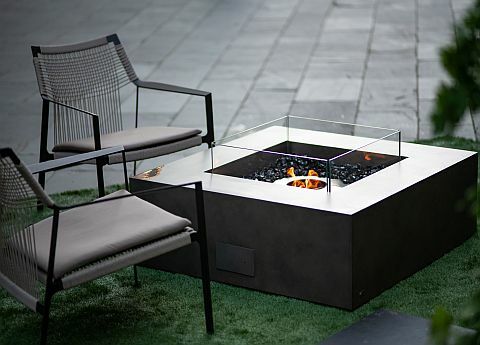 Manutti are world specialists in outdoor furniture and materials. They offer a wide range of fabrics including Batyline®, which is a UV-resistant, mass-coloured PVC fibre. It doesn’t fade in light or sunshine and it’s water-repellent, both swimming pool and sea water. It can also withstand extreme temperatures: -30°C (-22°F) to +70°C (158°F), and is super easy to clean and maintain. Environmentally it’s great too – no toxins, and 100% recyclable. Batyline is available in Mocca, Pearl White, White, Granite Grey, Bronze, Black, Flax and Linen colours. Then there’s their All Weather Fabrics which have been specifically developed for outdoor use. The fabric performs exactly the same as Batyline and Lotus. Inside there is a Quick Dry Foam which has a special structure that ensures that the water runs through three times faster, so it also dries three times faster than high resilience foam. Manutti use two different types of All Weather Fabrics: all weather basic (100% polypropylene) and Sunbrella® (100% acrylic). They also have a range of Nautic Fabrics and Nautic Leather. Nautic Leather is imitation leather based on PVC, specifically developed for outdoor use (such as the ‘leather’ you see on boats). Nautic Fabric is 100% olefin fabric and totally watertight. So as you can see – a huge choice! 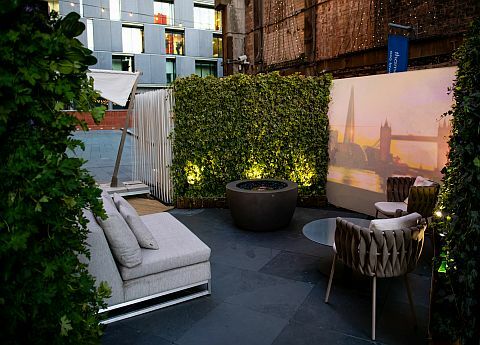 Urban Roof Gardens also chose a couple of our beautiful Tosca armchchairs to complete the look. Tosca is designed by Monica Armani for Tribu. They are amazingly comfortable and have a real wow factor. The design features soft, oversized braiding wrapped around a powder-coated stainless steel frame. The braiding is then filled with a new foam mouse which is then wrapped in a seamless sheath of knitted textilene and polyolefine for extra weather resistance. And didn’t our Nodi chairs look good! They’re designed by the highly regarded Canadian creatives, George Yabu and Glenn Pushelberg for Tribu. Light and extremely comfortable, the Nodi has a seat and back hand-woven in stain repellent, frost, UV and mould resistant CanaxÆ rope which is stretched across a powder-coated stainless steel frame. The slim profile of the arm is angled slightly inwards as if it’s welcoming you to sit down. Made from PVC and hemp, the woven CanaxÆ crosses in vertical and horizontal lines, providing a great shape and structure. It’s very strong and durable and the pretty rope work is also gently forgiving when you lean against it. If you missed the Festival there’s still time to check out our garden furniture. 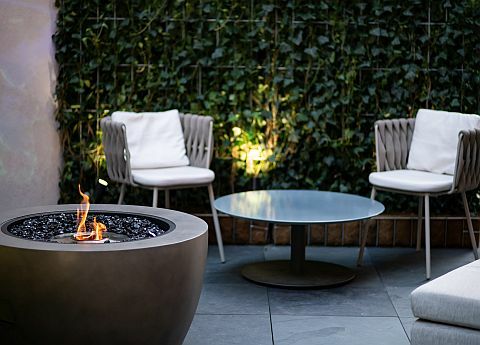 Pop along to our Kings Road showroom or browse the garden section of the Go Modern site. 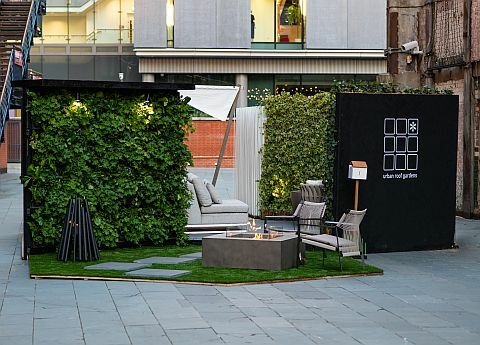 And if you fancy creating your own ‘green dream’ in the centre of the city go and talk to the great team at Urban Roof Gardens and share some of their green passion.